Early morning pick-up from your Bangkok hotel or train station. Be ready for an exciting day. Leaving the capital to the west takes you into the farmlands where waterways were and are the arteries to get goods and people to the markets. You will forget the tourists and feel how live is for the locals working the land. By boat it goes through the fields and orchards where depending on the season pomelos, longans, coconuts and orchids grow. Taste these fruits and some local snacks along the way! 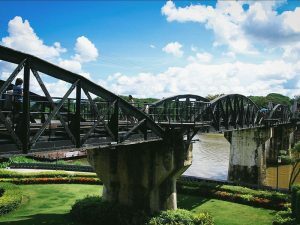 A chance to learn about the hardships of the prisoners before walking across the notorious railway bridge over the Kwai River is part of your program. Further upriver you board a long-tail boat to be taken for a ride to the very special riverside hotel that is your home for tonight; either a floating one in a bend of the river, or a tented one, perched high above on a ridge in the jungle. Grab a life jacket and jump into the flowing river to fresh up after a day of fantastic impressions! By boat you go further upriver with the jungle rising up on both sides. Local still fish these waters and occasionally monkeys are seen overhead. Visit a village of Mon people who live in this area and also across the border with Myanmar, not far. Their village is picturesque collection of wooden stilt houses where domestic animals roam freely, but also the occasional elephant. Mon are traditionally forest people and were much involved in logging with their big strong grey helpers. Today no longer, but an optional ride could be made. The lime stone hills are full of caves and exploring one is fun and takes you out of the sun for moment too. Enjoy a local lunch before returning to your booked hotel in Bangkok, railway station at the end of the afternoon.